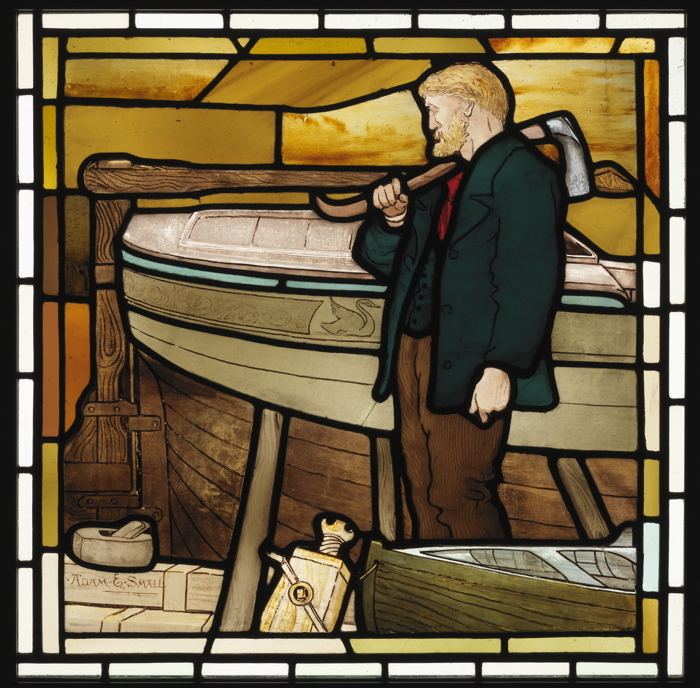 Twenty fabulous stained glass panels celebrating the trades that fuelled Glasgow as the 19th Century powerhouse of empire – among them the skills that gave form to G.L. Watson’s yacht designs – were recently reinstated at their original home, Maryhill Burgh Hall, during an inspired refurbishment. Made by one of Britain’s masters of the craft, Glasgow based Stephen Adam (1848-1910), and his business partner, David Small, the panels had lain for almost fifty years in Glasgow Museums’ storage facilities after 1960s removal from the “French hotel” styled building. Their realism is apparently unusual in comparison with other non-religious Adam & Small works, for example at the superb Clyde Navigation Trust building on The Broomielaw, and at Glasgow City Chambers. But perhaps that’s entirely appropriate for Maryhill, a Glasgow Burgh that grew solely on the back of the Industrial Revolution, with the Forth & Clyde Canal its lifeblood. “In old times, when the vessels were constructed of wood, a large number of carpenters were employed here, some of them swanky young fellows, and others regular blow-hard looking old chips. It was astonishing what neat, well-finished work some old boys could produce with nothing finer in the shape of tools than an adze and a jack-plane. For many panels, an educated guess can be made as to which local firm is being suggested. But in The Boatbuilder (or perhaps more correctly ‘The Shipwright’) panel above, the business dynasty depicted can only be that of the Swan family of ship and boatbuilders (and sawmillers, and spelters) who built and repaired small ships and boats at Kelvin Dock. When their ambitions outgrew the confines of that site, Swans may have become one of the first shipyards to prefabricate their builds; watertight sections being floated west for assembly and completion at Bowling, where the canal meets the River and Firth of Clyde in brackish confluence. Eventually that site also proved too small, prompting a final move to the Woodyard shipyard at Dumbarton not long after the launch there of the Cutty Sark. And this is how we found out about the renaissance of these superb panels. In Lloyd’s Register of Yachts 1886, the small yacht Zulu is recorded as built by J. & R. Swan of Dumbarton in 1872, as Whaup to the design of one G.L. Watson. Whaup/ Zulu was no stranger to yacht registers, having been recorded from birth by Hunt’s Yacht List and later Lloyd’s. But her designer’s name had not carried through – in fact designer names were never listed in Hunt’s and only in Lloyds from the mid 1880s. Could this be one of G.L. Watson’s earliest designs that for some reason went unrecorded? For more information on Scottish stained glass, its influences and strong wider influence, go no further than Michael Donnelly’s stained glass central. Use the thumbnails below to let the excellent Maryhill Burgh Hall web site and Gordon Barr guide you through some of these other panels relevant to the trades that built G.L. 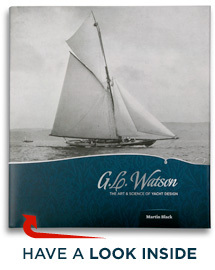 Watson’s yachts. This entry was posted in art, boatbuilders, boatyards, Clyde yachting, Clydebuilt, G.L. Watson, Glasgow, object of desire, River Clyde, shipbuilding, shipyards, yacht design, yacht designer, yachting history and tagged Adam & Small, adze, Forth & Clyde Canal, J & R Swan, Kelvin Dock, Maryhill, Maryhill Burgh Hall, shipbuilding trades, shipwright, stained glass, Stephen Adam stained glass, Swan Dumbarton, Swan Maryhill, Woodyard Dumbarton. Bookmark the permalink. What marvellous stained glass. See the whale on p.34!!! Hi Donal! Yes indeed. If it hadn’t said 1902 for the whale in Michael Connelly’s book, I’d have said 1960s.